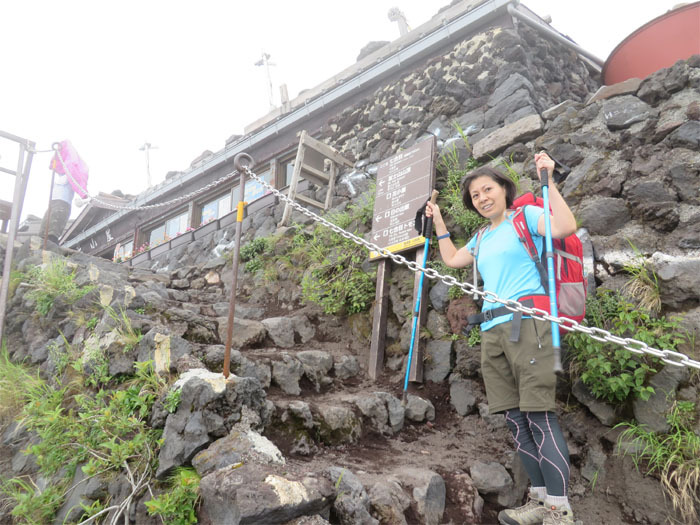 I’ve visited Japan 16 times but had never gotten around to climbing the iconic symbol of Japan – Mount Fuji. 17th time was the charm. Rewind seven month earlier as my wife, Mari, planned everything from the gear rental, hotel and hut reservations and bus rides down to the last detail. Details such as getting canned oxygen (never used) and oxygen tablets to give one an extra boost of oxygen at the higher altitudes (only Mari took these). Just before our trip to Japan, we learned that UNESCO had bestowed World Heritage status on Mount Fuji. Great for Japan. Bad for us – crowds. 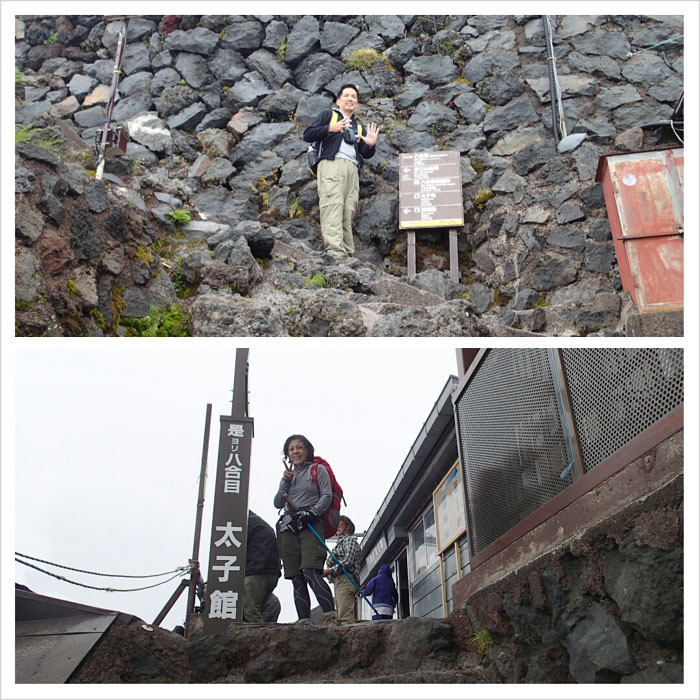 Getting off the two hour bus ride from Shinjuku, we arrived halfway up Mount Fuji at the Kawaguchiko 5th Station. Crowds of day tourists, students and hikers were milling around. 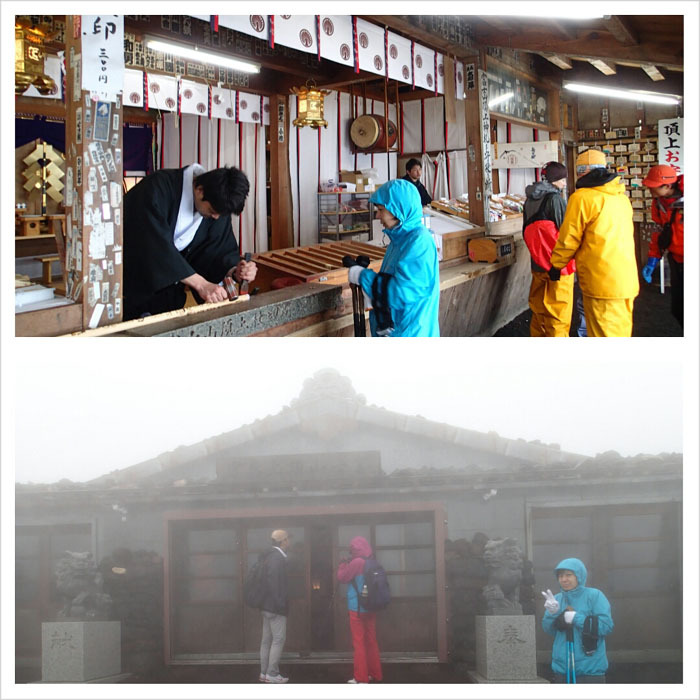 A lot of students and day tourists just go to the 5th station to gawk and say they went to Mount Fuji and get back on their bus. 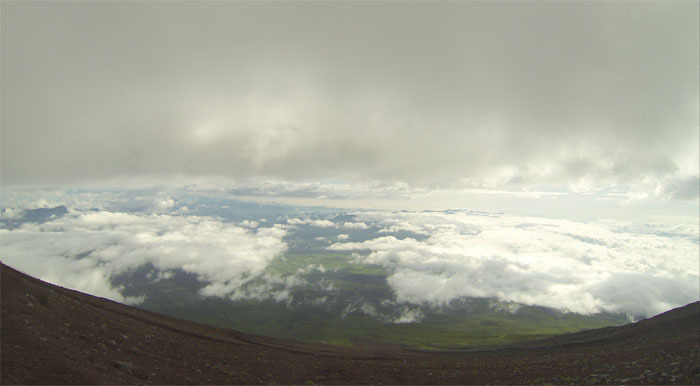 Mount Fuji’s summit was covered in clouds. The weather report had predicted rain for today. Too late to cancel our plans, it was Fuji or bust! I just prayed that the weather reporter was related to Guy Hagi. The air at 7,562 feet did not seem thin to me at all, but it’s recommended to acclimate yourself for an hour before hiking. So we bought a $5 hiking stick, paid 50 cents to use the toilet and looked at the various tourist trinkets until it was time to go. We pushed off from the trailhead at 10:45AM as we joined others making the climb and returning from the summit. Mari walking next to a horse drawn cart, that will take one all the way to the 7th station for a small fee. Climbing season runs from July to August. I was pleasantly surprised to find the trails not as crowded, probably because we were doing it on a weekday. Expect madness and gridlock on weekends and holidays. 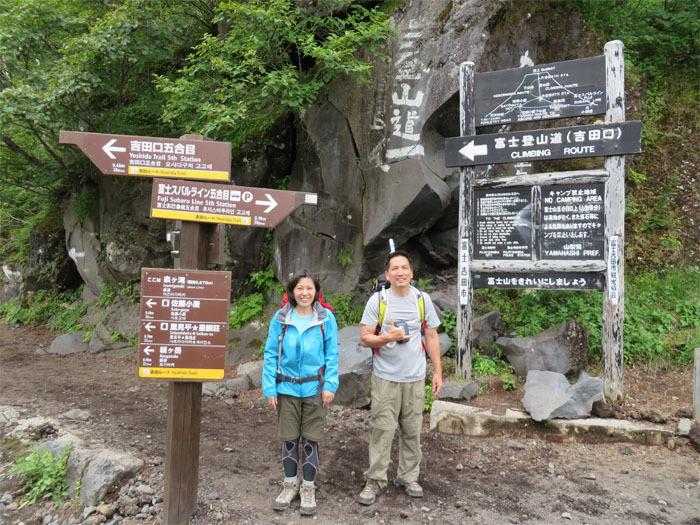 The downward slope of the trail led us to Izumigataki junction at 11:08AM and we took the right fork up to the climbing trail. 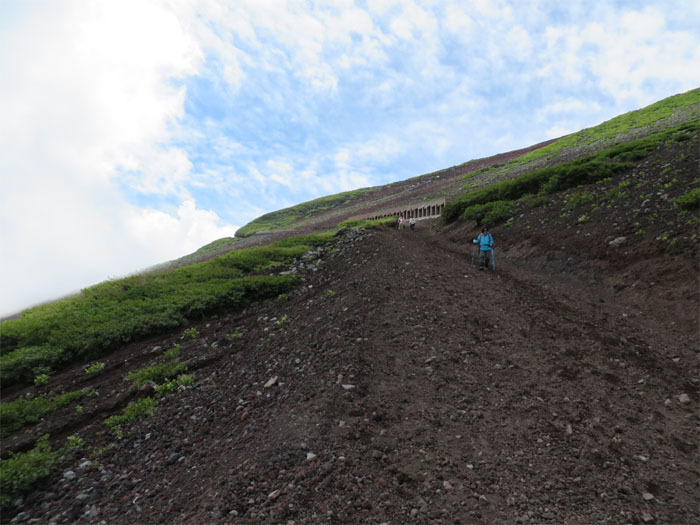 The slope of the trail now started to pitch upward. Notice the trees, they would soon be gone as we got higher. 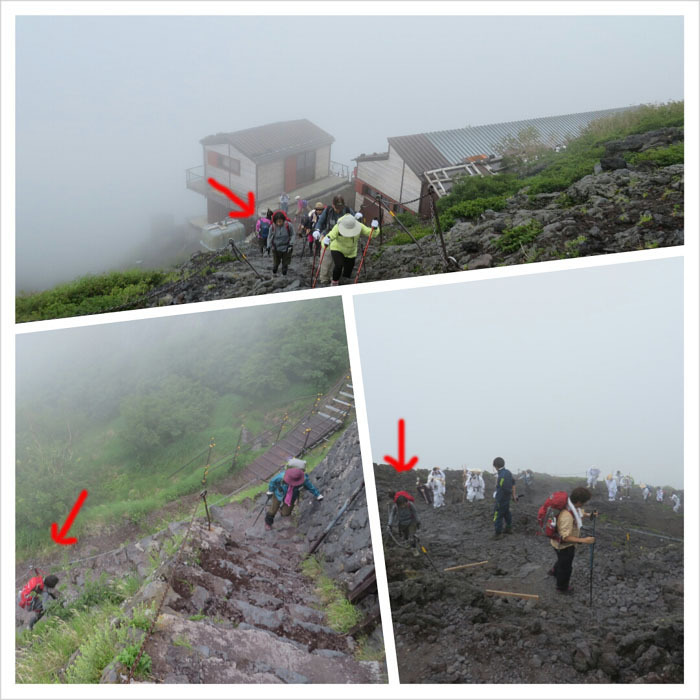 We reached the 6th station at 11:37AM and were handed maps, that they have in Japanese, English, Chinese and Korean. At the time, we didn’t even know it was the 6th station. No more trees to be seen. 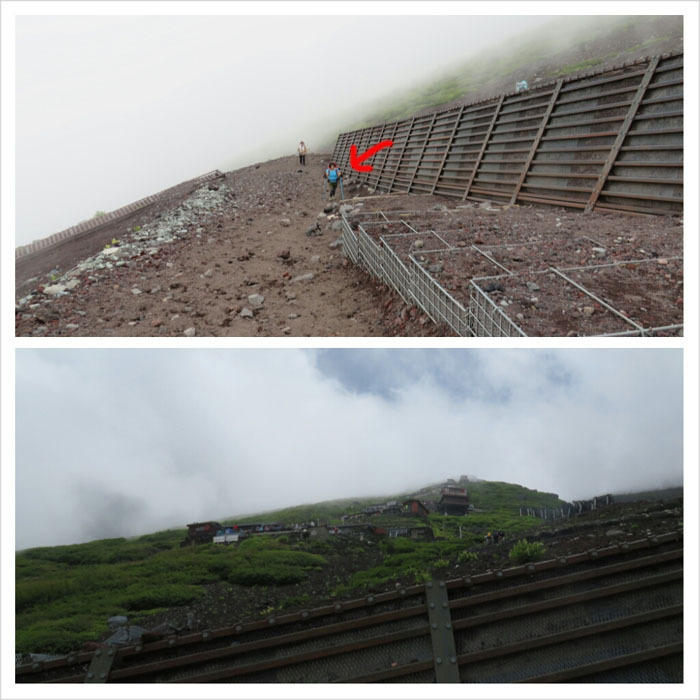 Mari coming up the switchbacks which are safely shored up by massive fences to prevent erosion. We saw a string of huts perched on the slope of the mountain as we made our way up. 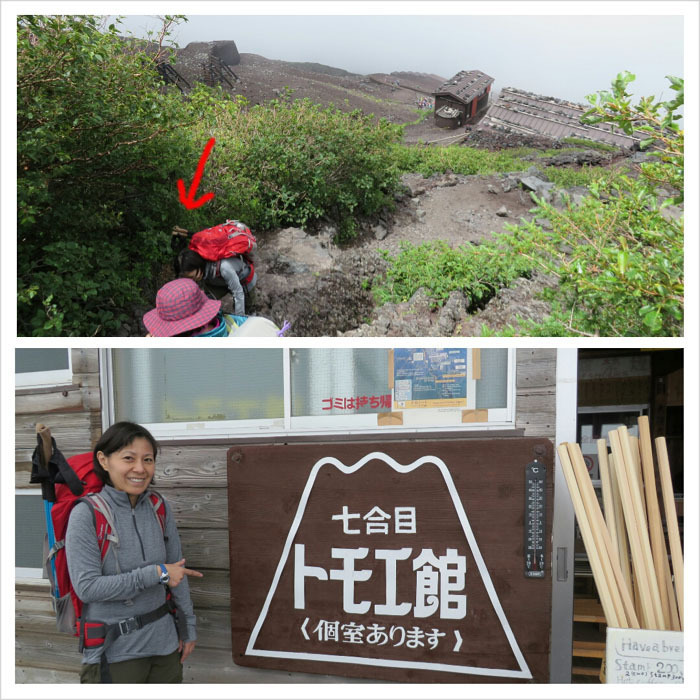 At 12:43PM, we reached the 7th station, first of many huts on the trail. Mari was so happy as we didn’t know we had passed the 6th station earlier at 11:37AM, and now we were at the 7th station! Shelling out 200 Yen or roughly two bucks for the first of many stamps on my hiking stick. Every hut that we passed sells water, snacks and of course a stamp to put on your stick. Mari climbing up the rockier part of the trail. Fun, fun, fun! 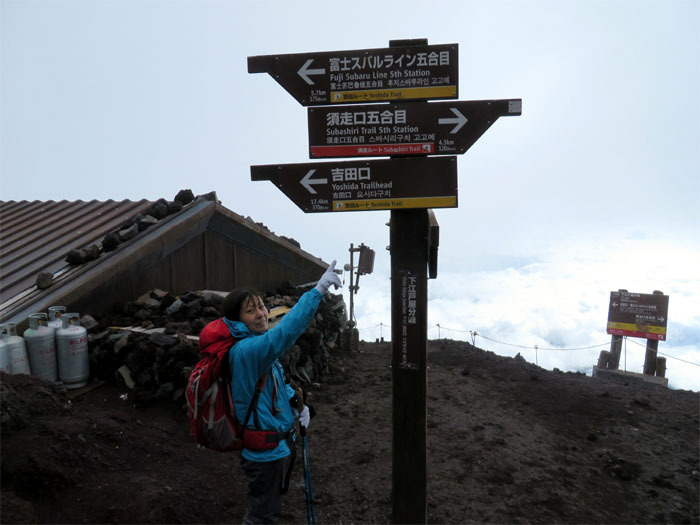 Reaching another 7th station hut. 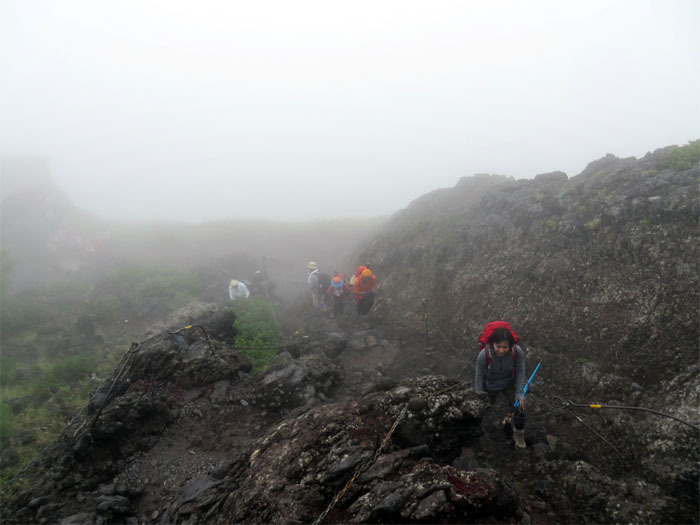 The trail from the 7th station to the 8th station is on very rocky terrain, lot of climbing involved. Luckily, huts are spaced out every 15 minutes or so to take breaks or shelter if needed. 203 minutes to go. At whose pace? The trail was dotted with informational signs that tell you how much distance and time until the summit. This section of the trail we shared with a stream of white clad chanting Buddhist monks. One of the monks actually fell in front of me, and another monk and myself helped him back up. Hopefully I will get good karma for my actions. Fat chance. Reaching the first of multiple torii’s or Shinto gates that marked the trail. 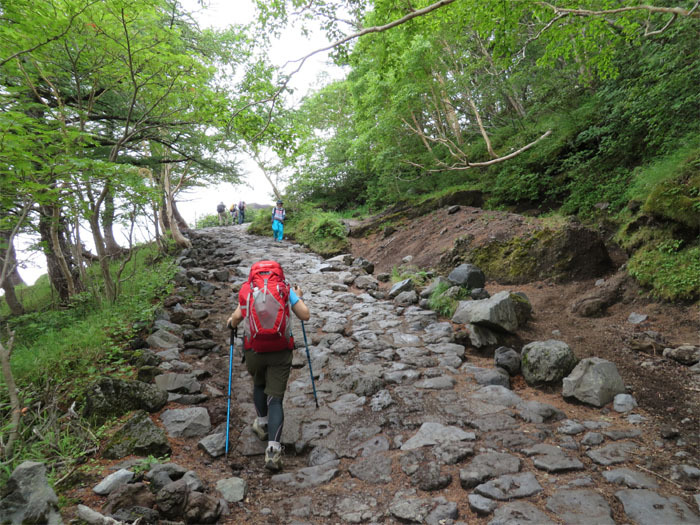 More climbing on the rocky trail, only one way to go – up. Mari popping out of the clouds. 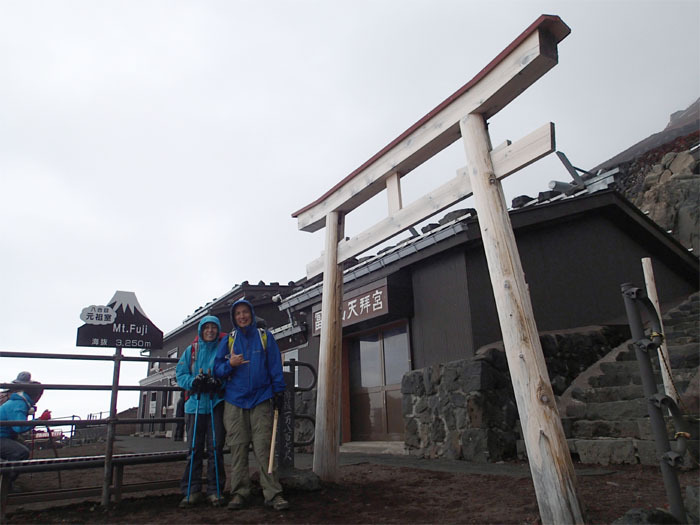 After passing multiple 7th station huts, we made it to the first 8th station hut at 2:37PM. Air was getting thinner at 3,100 meters or 10,171 feet. Every now and then, the cloud cover would give us a peak at the scenery below. The rain started as we approached the top. 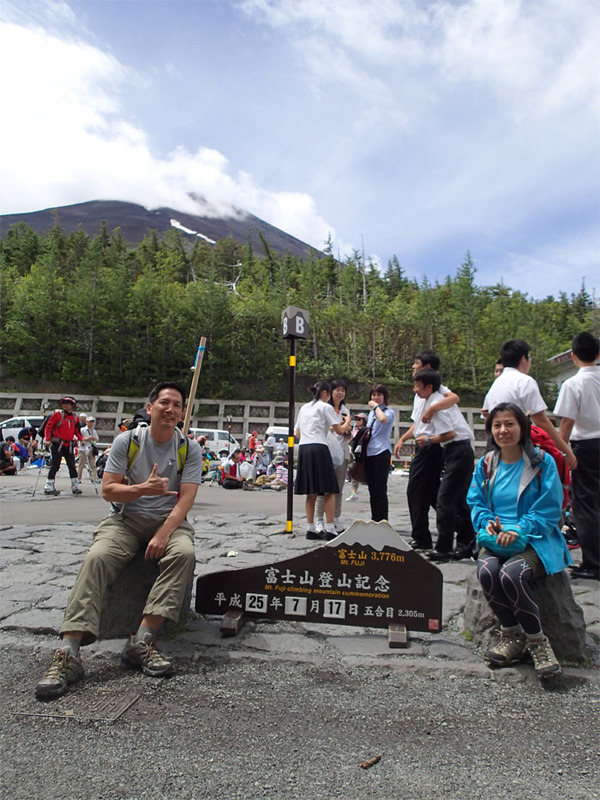 Matthew from New York took our photo at this 8th station that we reached at 4:00PM. He was doing it in regular street clothes, those tough New Yorkers! Matthew had actually started the climb to Mount Fuji at the bottom, so he can actually say he climbed the whole mountain. Whereas, we were only climbing half the mountain. Hey, we got to start from somewhere. I want to hike from the bottom next time, Mari not so much. We reached the original 8th station at 4:32PM. 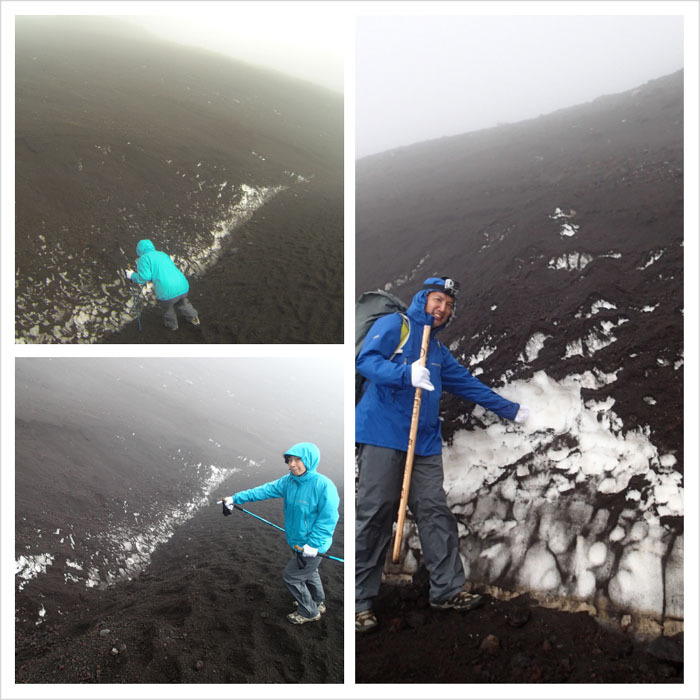 The temperature dropped to 8 degrees Celsius or 46 degrees Fahrenheit at an altitude of 3,400 meters or 11,155 feet. We got to “our” hut at 4:50PM. Reservations for Saito? Cost was about $65 per person and they throw in a free meal. It’s best to make reservations ahead of time, otherwise you might literally be left out in the cold. It was such a relief to get inside and away from the cold wind and rain. Dinner was served at 5:29PM and consisted of a cup of hot green tea, beef curry, hamburger steak and rice. After downing the Japanese TV meal, we retired to our “spacious” sleeping quarters upstairs. It was basically 12 futons sectioned off. We were supposed to keep quiet so as not to bother the other hikers that had retired early. But people walking up and down the hallway, chatting away and the PA blaring out names for dinner kept us up until around 9:30PM. After groggily waking up at 1:00AM to the rain pounding the roof and the winds shaking the walls, we got ready to climb the last stretch to the summit and see the sunrise. 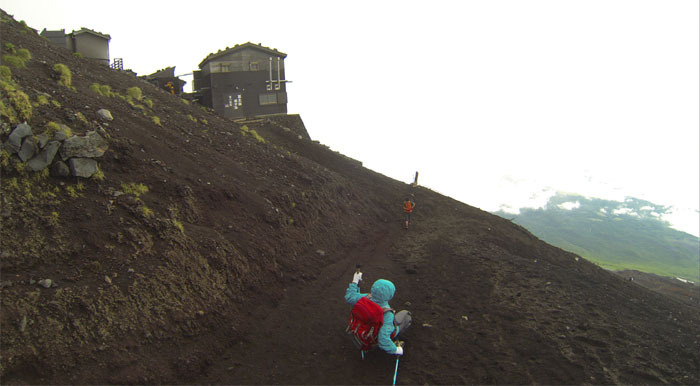 One of the selling points for this hut was that they allowed you to leave your pack behind, so that you can climb to the summit relatively unencumbered. Guess who got to be the pack mule? 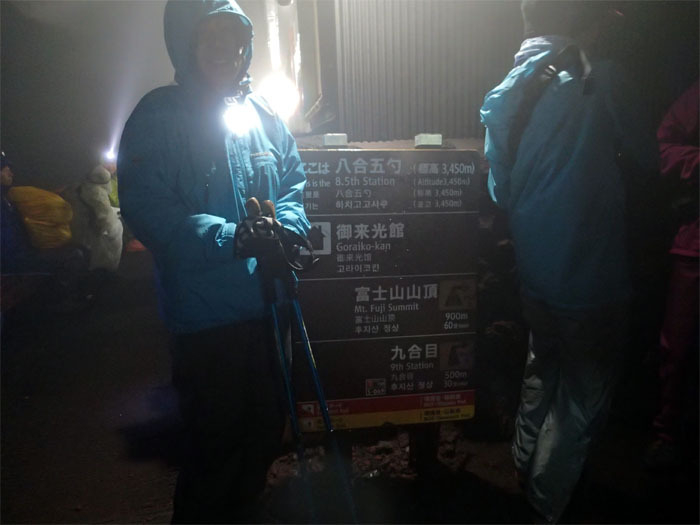 We left the relative warmth of the hut at 2:01AM to head outside and resume our climb. There is usually a line of people waiting to make the final push to the summit. The weekday and the storm combined to cut the usual crowds to dozens instead of hundreds. We met up again with Matthew at the 8.5 station hut. Too early to get a stamp, was running out of room on my stick anyway. 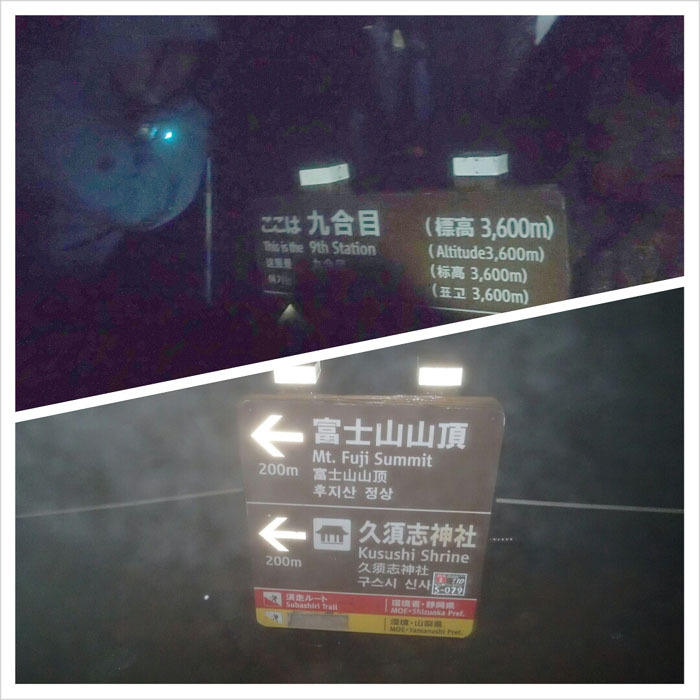 The wind and rain seemed to get stronger as we got to the 9th station at 2:50AM. At an altitude of 11,811 feet, we only had 656 feet left to the summit. The Gore-Tex jackets and pants helped us to stay dry despite the pounding rain and freezing wind. The only thing we were missing was Gore-Tex gloves, as our hands were wet and freezing the whole way up. 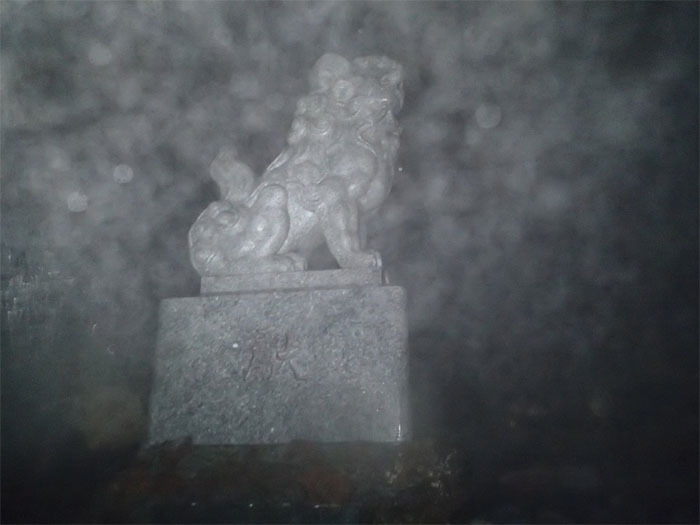 I almost missed the two stone guardian dog statues at the summit entrance due to the storm, luckily a fellow hiker pointed it out. 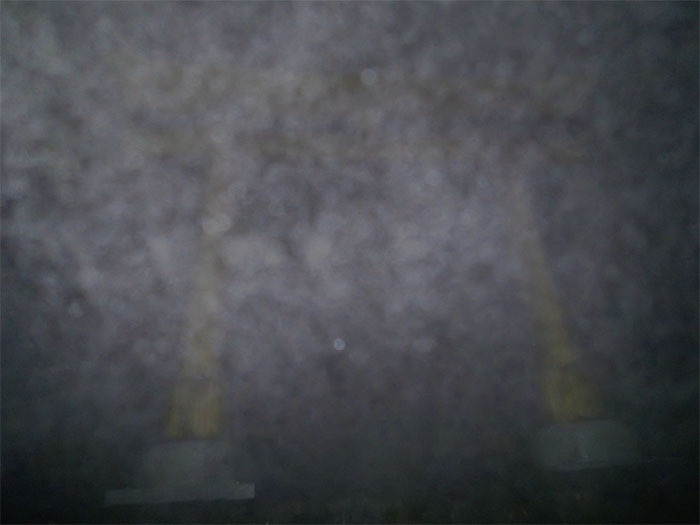 We could barely make out the summit torii as it was being washed over by the rain storm. We made the summit at 3:29AM to be greeted by the twin neon glow of vending machines! 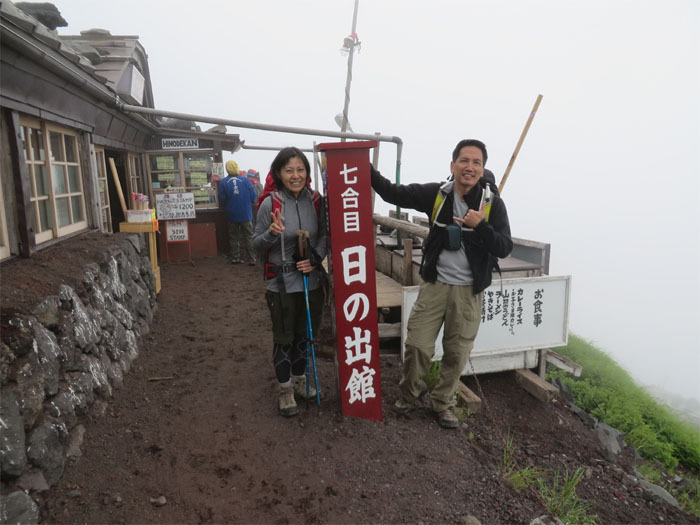 On top of Mount Fuji! How odd and Japanese at the same time. The temperature must have been close to freezing at the top, so we all tried to find scant shelter from the wind and rain wherever it could be found. A couple minutes later, the outside lights came on and we were attracted like moths to a flame. Everybody was chomping at the bit to get inside and away from the cold. We had to wait a couple of minutes until they got everything ready. We all streamed inside, cold and shaking. At least a couple foreigners were wet and freezing as they had not come prepared and were close to hypothermia. 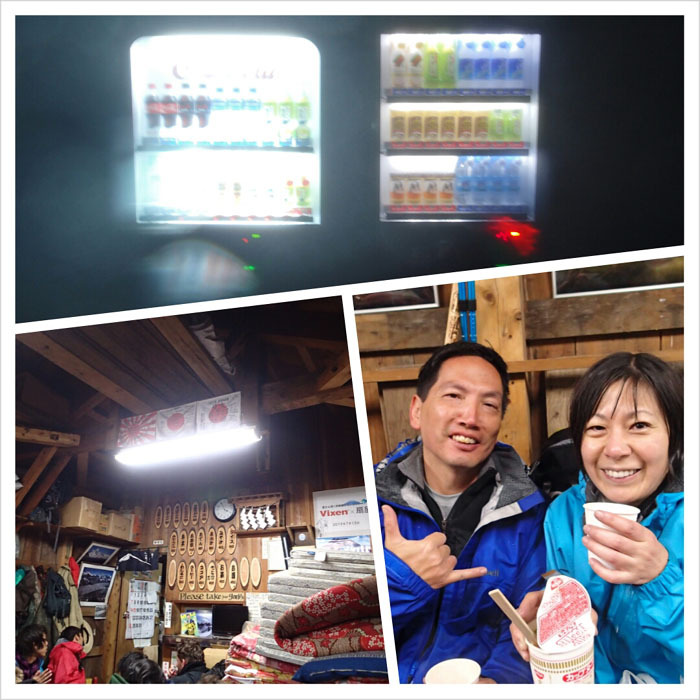 The hut owners were charging $5 for a small cup of hot cocoa and $7 for a cup of noodles. But when you’re cold and wet, you would pay black market prices to get something warm in your tummy. As the sunrise time came closer, I decided to venture out into the storm to try and get a picture of the sunrise. Key word – try. We made it to the top of a 12,172 foot mountain to get buffeted and pelted by a freezing rain storm, all to see a magnificent sunrise. Instead we caught a brief flash of light at 4:46am, before the clouds quickly swallowed it back up. Such is life. Photo opportunity. At least we got a sign to take our picture with, but we would rather have the sunrise. Pretty please. Getting the final stamp on my stick. I collected a total of 22 stamps on my stick, which cost about $36. We forgot to pray at the shrine. No chance of walking around the crater in this weather. 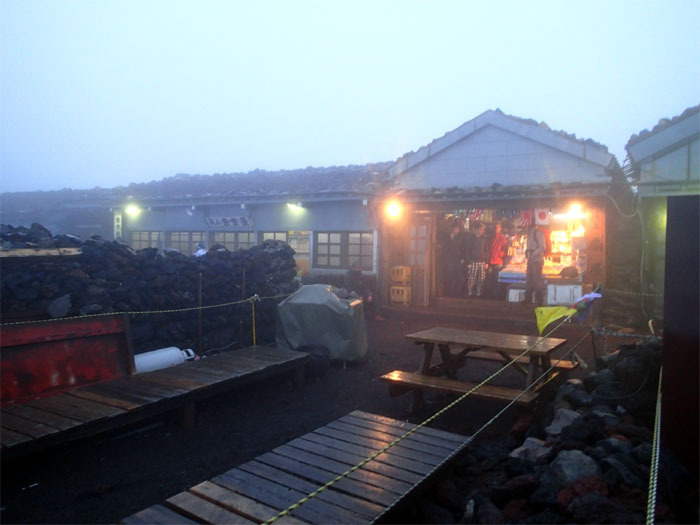 We had to pay one of the shop owners to get our postcards mailed from the summit, as it was out of the question to walk to the post office on the crater in this storm. We also paid $8 for a bowl of pork miso soup to help keep warm. 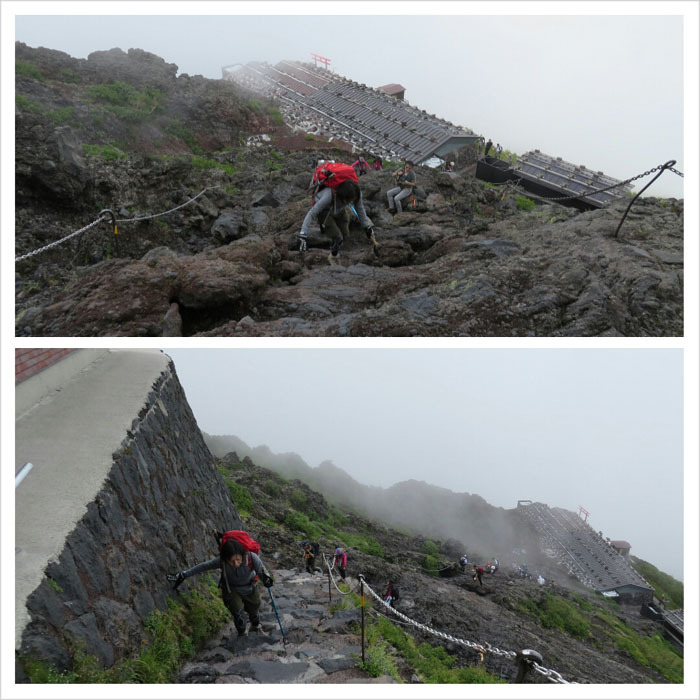 At 6:45AM, the storm was still raging but at somewhat reduced strength, so we decided to make our way down. The trail is not the same as the one coming up. 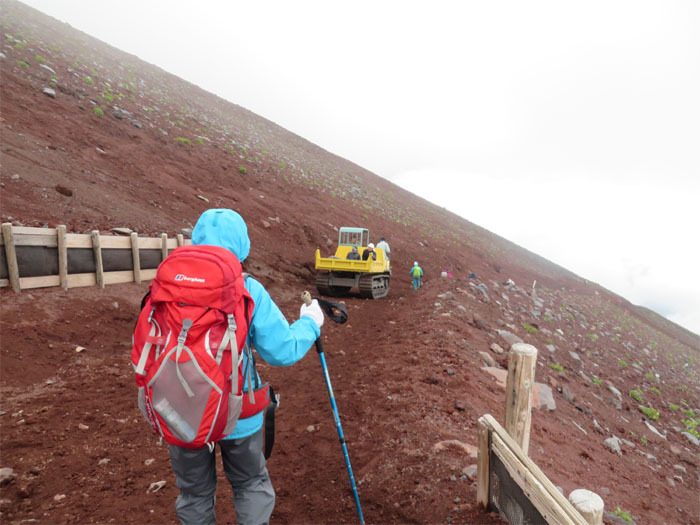 It connects to the 8th Station and then switchbacks all the way down to the 6th Station, bypassing all the huts and along with that the snacks, water and benjo (toilet). 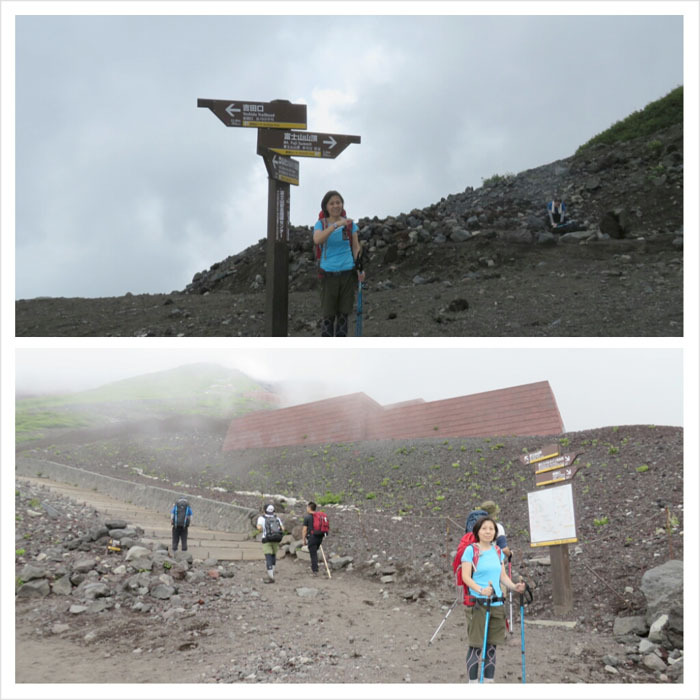 The wind was literally pushing us around as we made our way down the Yoshida trail. We hugged the mountain side going down, as this trail section didn’t have any fencing to prevent us from being blown off the trail. It was that windy! We came across a patch of snow. Not enough to make a snowman, but enough for a snowball fight. 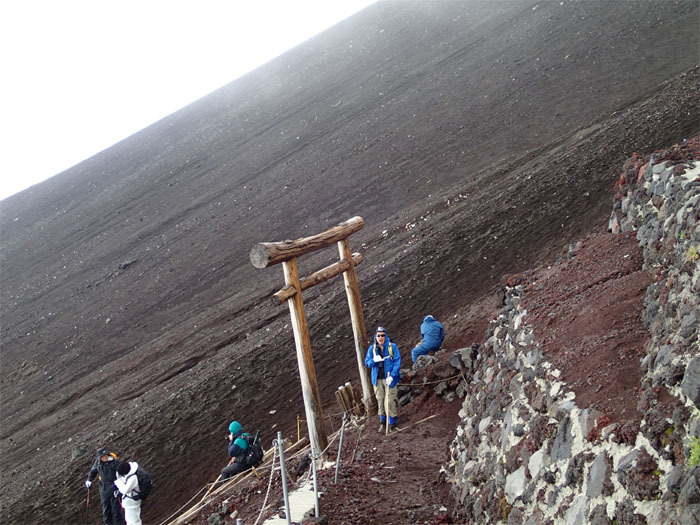 Making our way back to the 8th station hut. As we got lower, the clouds started to clear up. Prompting almost everybody to stop and take out their cameras as it was a no view hike until now. The cloud deck started opening up to reveal the mountains and lakes. Taking a small detour to get back to our hut to retrieve Mari’s backpack. Coming down the pitched volcanic ash trail tripped Mari going down. Luckily only her ego was bruised. Here the trail continues to the left on a narrow trail that continues down the mountain. 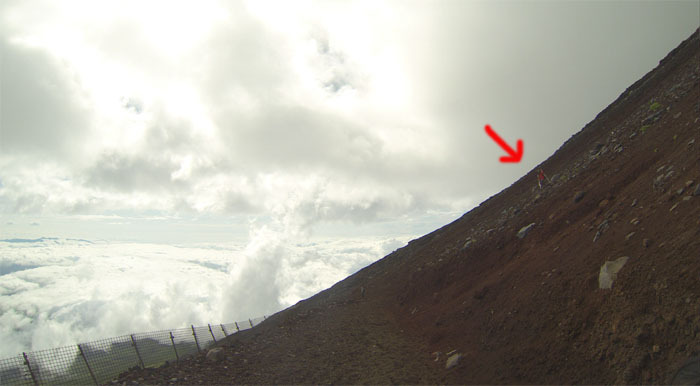 We saw this one hiker that was not doing the switchbacks. He just ran down the side of the mountain using walking sticks as support and brakes. Not smart and safe for other hikers. 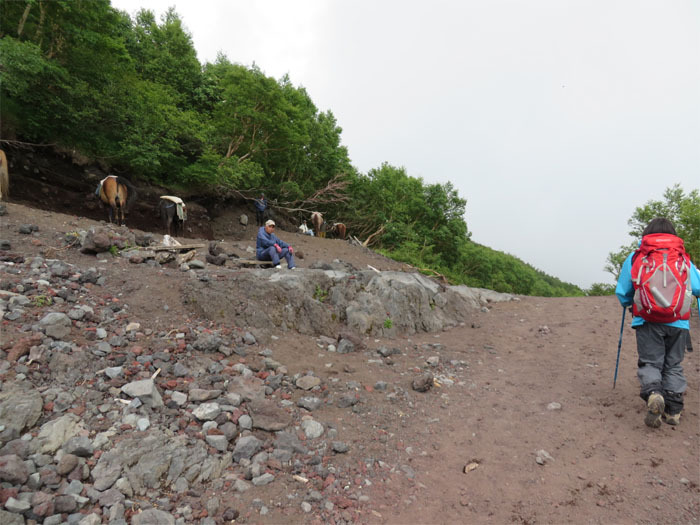 As he was running down, he was dislodging rocks onto the trail and almost fell off. 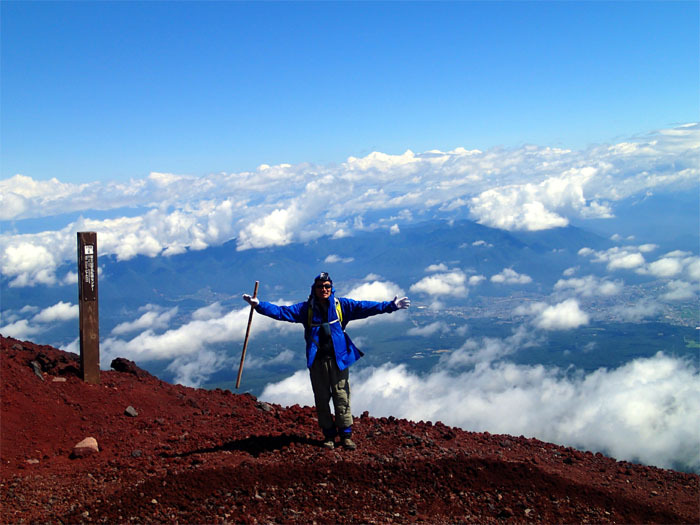 Mount Fuji is not a technical hike and can be done by most people of all ages in reasonable good physical condition. Now if you want to make this hike an extreme one, check out this link! A nice view of the scenery below us. We saw numerous bulldozers coming up the trail as work crews started working on excavating new trails. This is how sick people get down the mountain. We took an anpan break at sign #42 at 9:05AM. The hut we bought it from said it was the best anpan, when you are hungry, your stomach will agree with anything. It was actually pretty tasty. 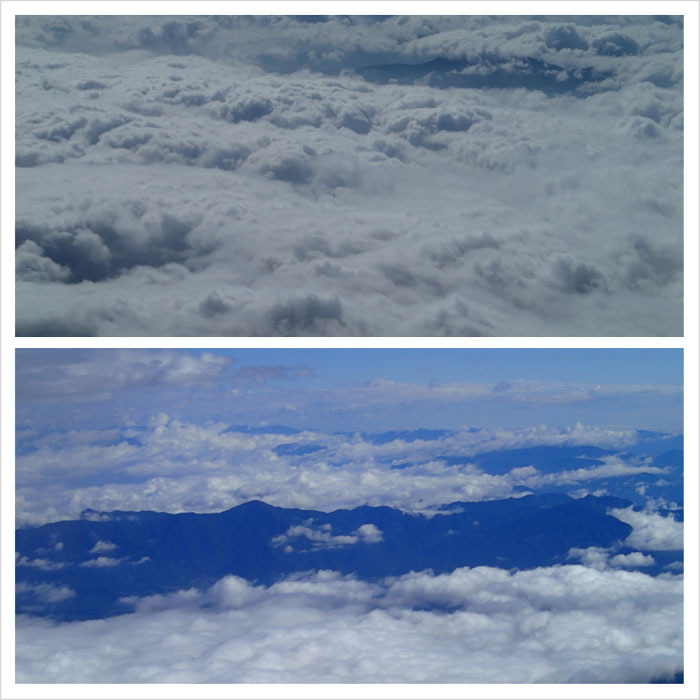 As we kept dropping in altitude, the clouds starting to clear up along with great views. Too bad it wasn’t like this at the top! Mari with Lake Yamanaka in the cloudy background. The town of Fujikawaguchiko in the cloudy background. We passed the last set of tunnels that are supposed to protect hikers from falling rocks. 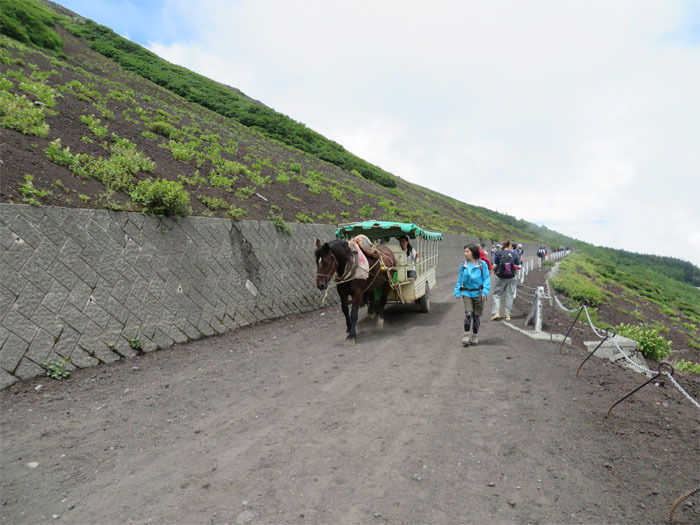 As we made our way back down, there were a couple of oji-sans (older men) with horses calling out to hikers if they wanted a ride back. For a small fee of course. 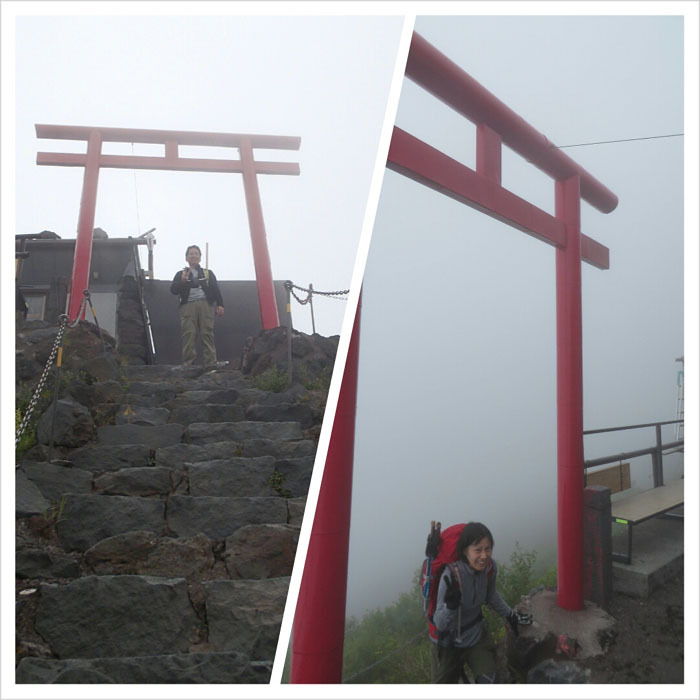 We made it back down to the 5th station at 11:14am. The round trip was a total of 13.8 km or 8.57 miles. 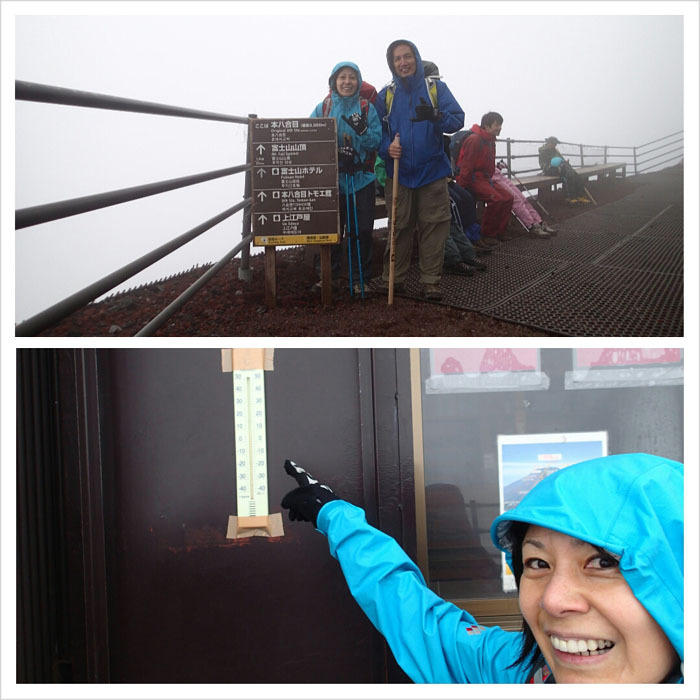 We gained 1,405 meters or 4,610 feet in elevation. 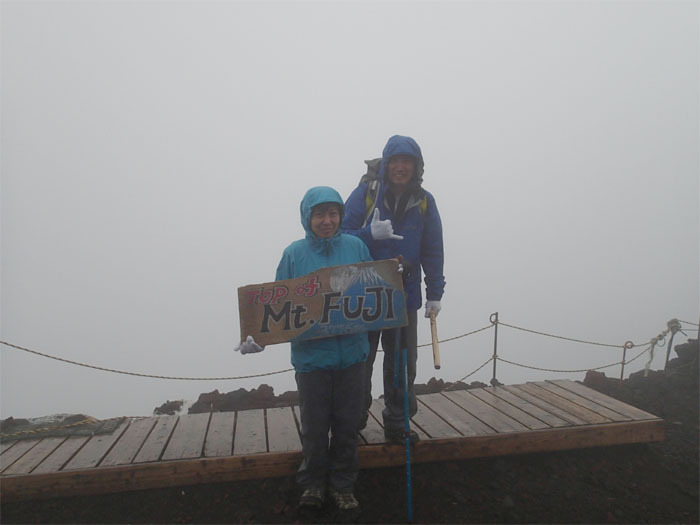 We were both so happy to have completed the hike to Fuji-san. As the Japanese say, a wise man climbs Fuji once, and a fool twice. Call us fools as we will be back for our sunrise! Kenji-san and Mari-san; Sugoi ga subarashi desu! I enjoyed your story and photos very much. 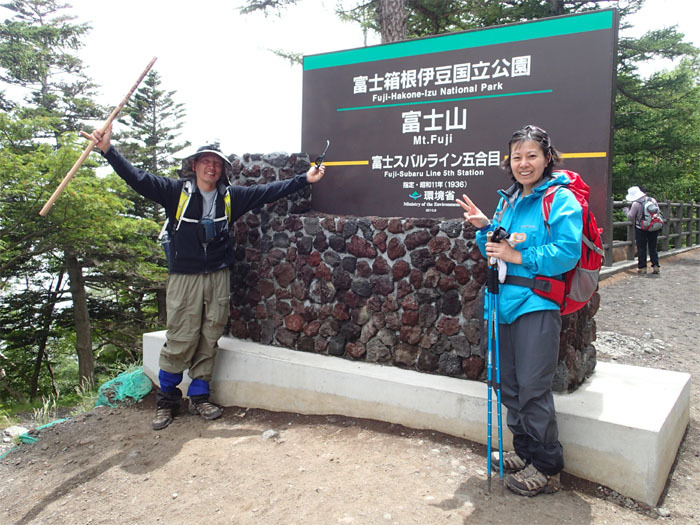 As I read your comments and saw the photos, I could feel the cold and the length of time it took to make it to the top of Mt Fujii. You should make your photos and comments into a book for yourselves. Wishing you good luck on your 2nd try next year for good weather and a beautiful sunrise. Gambatte kudasai! Thanks for taking the time to read our Mt. Fuji post! Glad you enjoyed it. Yup, we are hoping for a beautiful sunrise next year as well, I guess it’s all luck and timing! What an accomplishment!! Congrats! !–also, the comments and description of your climb was so enjoyable to read! Funny; I always thought of Mt Fuji as always covered with snow! Thanks for sharing and for all your hard work taking us along on your journey! Thanks for stopping by and your kind words. Mari says to hug your babies for her! Thank you Kenji-san and Mari-san for sharing your wonderful pics and detailed narrative!!! Really got my heart pumping as you took us along on your climb and descent. Congratulations on climbing Mt. Fuji! Wow! Thanks for visiting the blog, I had help from Mari as she was the proofreader. Have to give her some credit! Wow, what a journey….thanks for sharing, I really enjoyed it. Felt like I been to Mt. Fuji myself. Not sure if I could make it, cause it looks very challenging. I give you both credit, that is amazing. Thanks for taking the time to read our little hiking adventure! I’m sure you can make it, just make a FHB team and go to Japan, business purposes of course! What a great hike. I truly enjoyed all the pics and your comments on each pic. You kept me entertained. 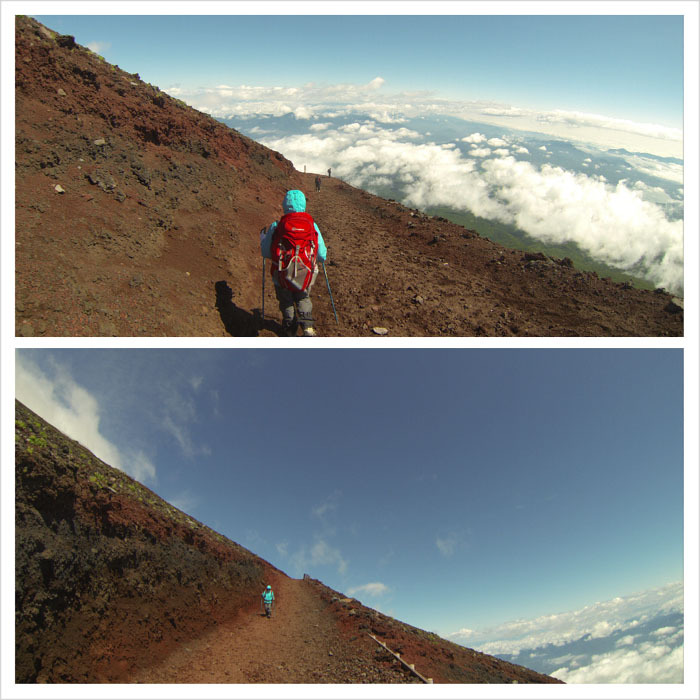 Seeing all those beautiful scenery makes me want to return to Japan; but climbing Mt Fuji….no thank you. Kenji, you are such a great writer and I felt that I was there as you explained all the stations and lookouts on your journey. 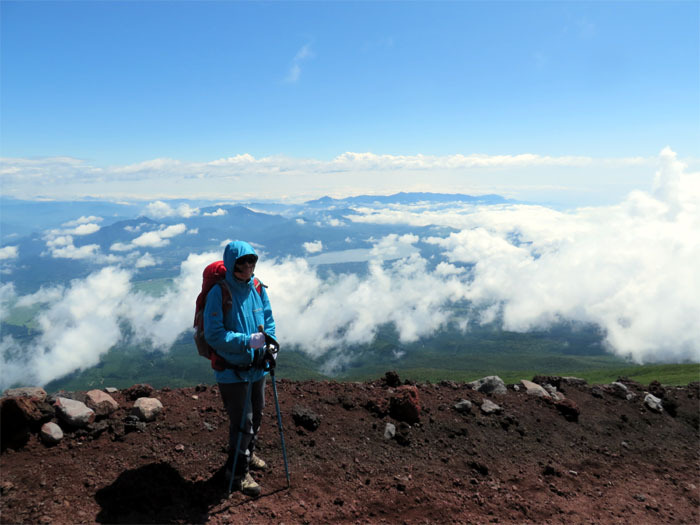 Good luck on your next hike from the bottom to the top of Mt Fuji when you plan your next journey….thank you for sharing your “great” adventure. I’m glad you enjoyed our Fuji trip. 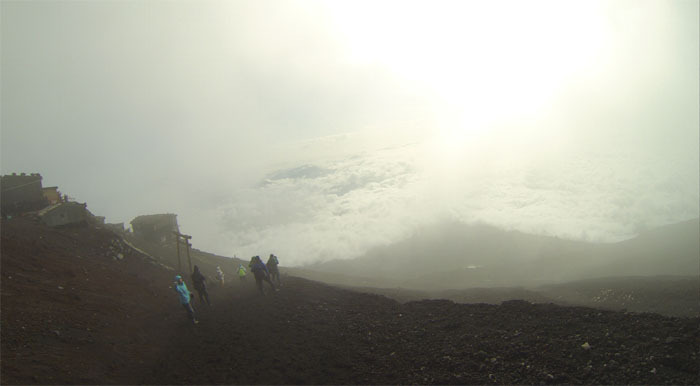 You can always just go to the 5th Station by bus, so that way you can say, you were on Mount Fuji, for a little while. Awesome write up, thank you Kenji and Mari! One day I hope to go to Japan and Okinawa and Mount Fuji will be up there on the to do list. Thanks for the kind words bro! Maybe we can assemble a caveman hiking crew and do it in the winter, the hard way! Let Marcus know! Congratulations! What an awesome accomplishment! Thank you for sharing your experience (I enjoyed it all from the comfort of air conditioning and a soft chair). Wonderful! Thanks for stopping by and glad you enjoyed the read. 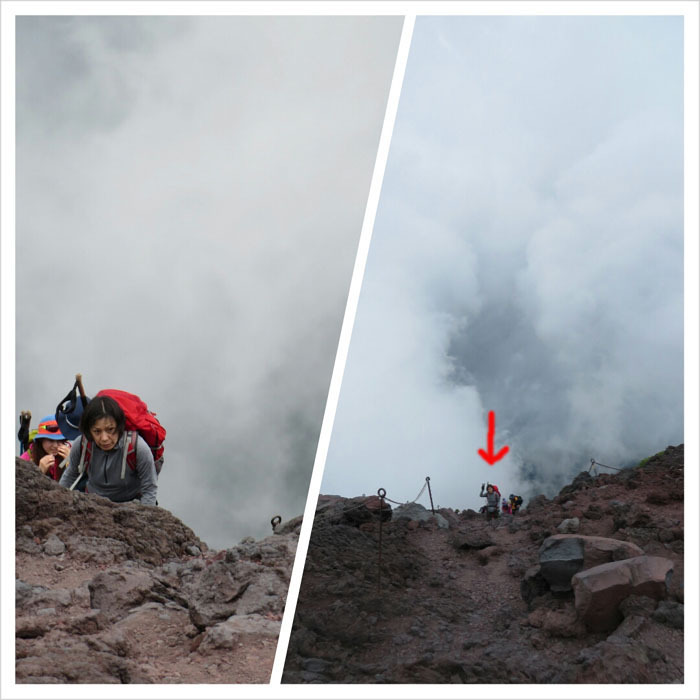 Your blog and photos is one of the best I’ve seen (my husband and I climbed Mt. 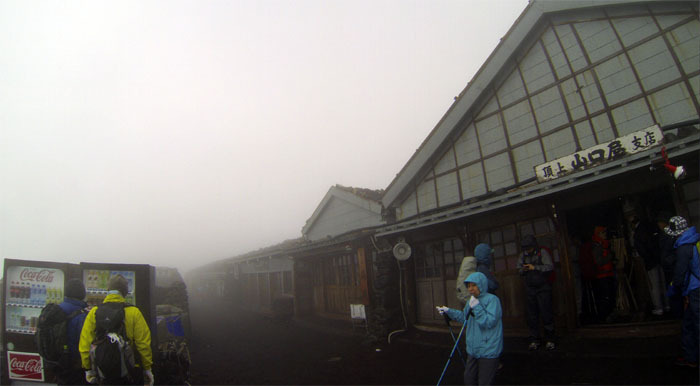 Fuji yesterday) . Thanks for sharing! Thanks for the kind words and glad you enjoyed the post! How was your sunrise? Hope it was better than ours! Thank you very much for sharing the awesome photos and Kenji’s comments. It seems not that simple and easy. Especialy from station 7 to station 8 the trail looks pretty rocky. Mari, nice jacket and the color can spot you from afar. Thanks for taking the time to read our post. 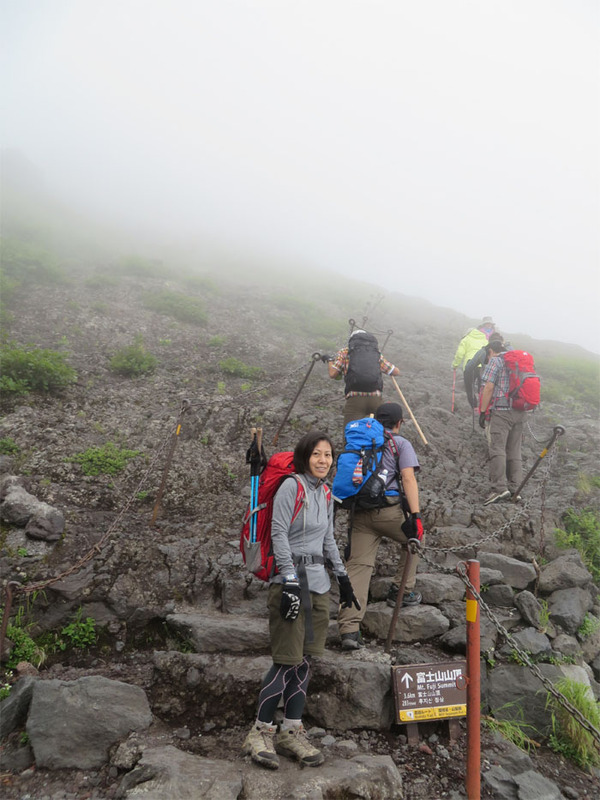 It’s not easy but not hard, if you’re in good shape, you should be able to hike Mt. Fuji. Ganbatte! Thanks for dropping by and the kind words! You have to pursue your dreams! Hope everything is well with you and your family bro! Thanks for reading our post and the kind words. Yes, it was quite a memory and we want to go back and make more, hopefully sunny ones! We haven’t seen you guys in awhile and hope everything’s well! Kenji and Mari…Wow! What a wonderful adventure. Thank you for sharing your photographs and the tales of your journey with us! Thanks for stopping by and letting us share. Hope you and Dave and the arinc family are doing well! Fantastic pictures. You and Mari are true troopers! Thanks for sharing your experience with us. Have you thought of walking the Camino Santiago (Pyrennes Mountains from Spain to France)? Thanks for stopping by and glad you enjoyed the post. We will check out the The Way of St. James, as I’ve actually heard of it before. Have you guys done it? 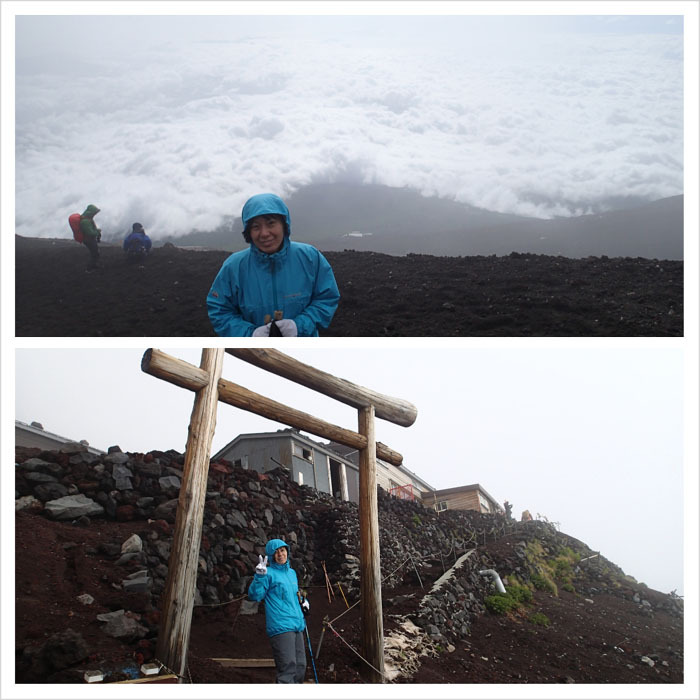 so, thank you again Mari-san for sharing the powerful pictures that made me feel cool like being at Mt.Fuji. and, I like other pictures with other titles by Kenji-san. I imagined such life with full of nature and living thing that I have never been . I enjoyed !! Thanks for dropping by and your kind words. Sorry your Japanese comments didn’t work. Glad you enjoyed it. Conglatulations to climbing Mt. Fuji !! Since I’ve never climbed Mt. Fuji, I was happy to see a lot of photos. In particular, I agree to your comments to Extreme hiker. Anyway, there are a lot of charming mountains in Japan, why don’t you try to climb them if you have a chance? I will see you again! Thanks for visiting my blog! Glad you enjoyed the post. Maybe we all can hike those charming mountains you mentioned the next time we visit Japan. Hope your family is doing well! 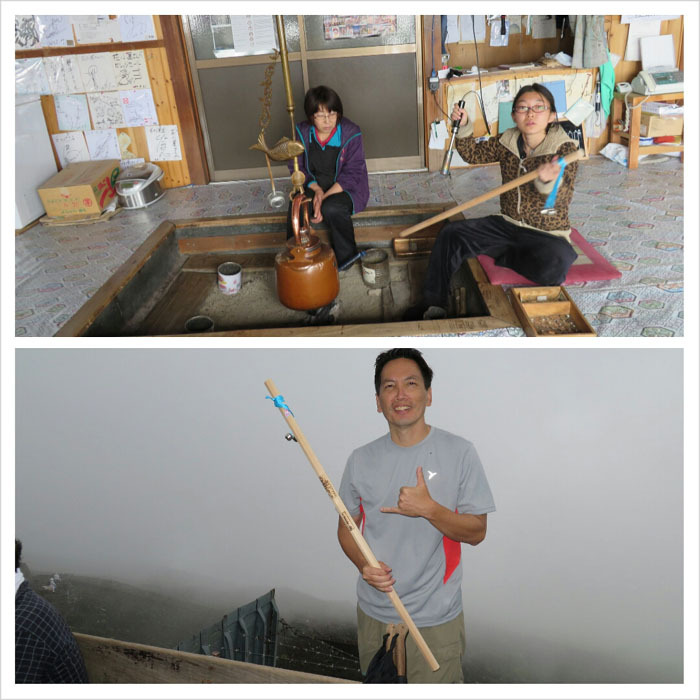 Thank you so much for sharing the delightful stories and awesome pictures from your first Mt. Fuji climbing! I really enjoyed them. What an accomplishment! I am in Japan and much much closer to it, but have never done it. The highest I tried is Mt. 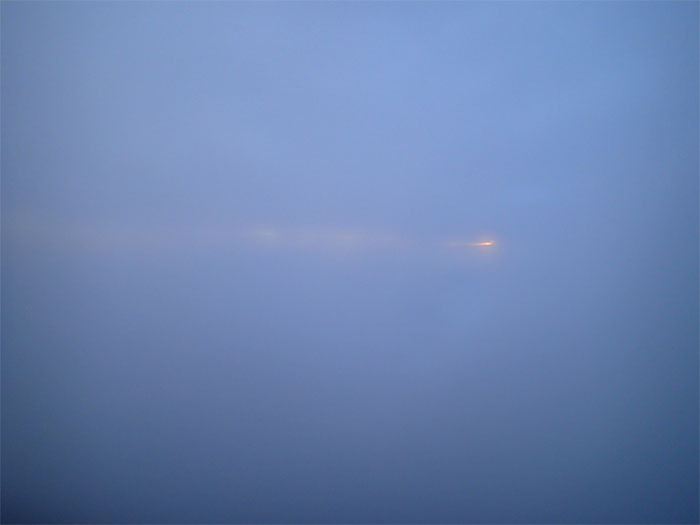 Shibutsu (2228m) in Oze, more than twenty years ago… I believe Mother Nature will smile for beautiful sunrise next time. Thanks for reading our post and glad you enjoyed it. You can always climb Mount Fuji, she’s not going anywhere! We are hoping for a beautiful sunrise as well next year! Hi Mari and Kenji! Wow what an awesome adventure! : ) just seeing the photos makes me want to do that hike too. not sure if i’ll make it all the way to the top though… i might need to get piggy backed down! Thanks stopping by and glad you enjoyed the post. 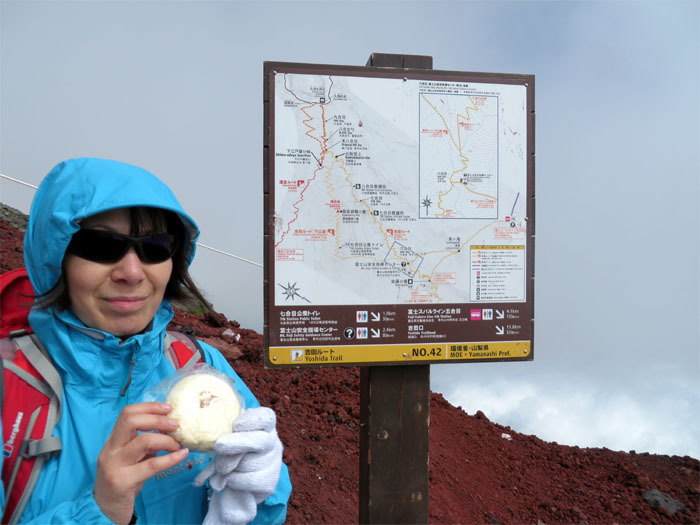 You gotta do the hike, it would be a piece of mochi for you! Hi, Having spent 6 years in Japan as a ski Instructor on the north Island, I have visited many parts of this beautiful Island, but never Fuji san!!!!!! I could not go back to Hokkido this year due to health reasons, but have a year to rehab and I plan to be a wise man!!!!! Thanks for all the pics, congratulations!!!! Loved thus blog, thank you!! 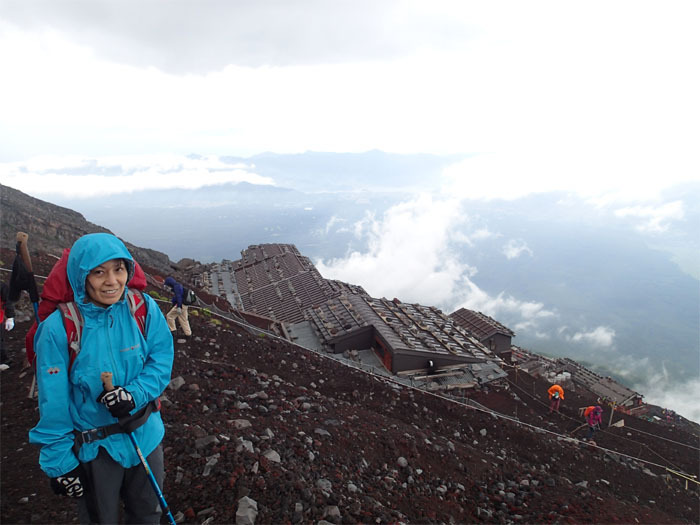 I am actually preparing to climb fuji this coming August, and I am so glad I stumbled across this blog. Did you climb without a guide? If so, was it ok? And also, what time if year did you climb it? Thank you! Thanks for visiting! No guide, we just went by ourselves, the trail is pretty much marked to the top. We went in July and we got lucky, it was actually cool and overcast. 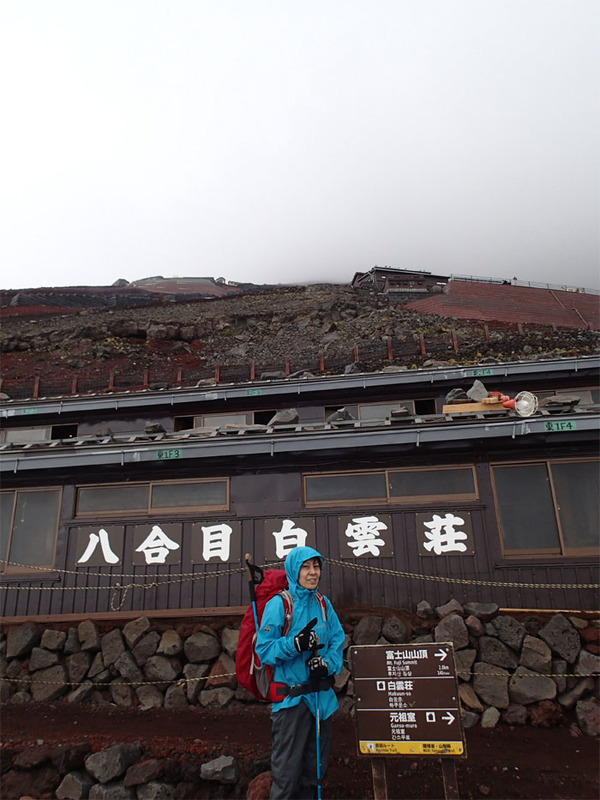 Usually it’s hot, but bring warm clothes and raingear as it will get very cold at the top. We saw some hikers who had hiked up only in t-shirts and they were suffering from hypothermia as a storm happened to be raging at the top. If you go during the official hiking season which runs from July to early September, the huts that dot the trail sell water and snacks at tourist prices of course, but that can lighten your load if you take that into account. Hope you have fun and get to see a beautiful sunrise! Thank you. 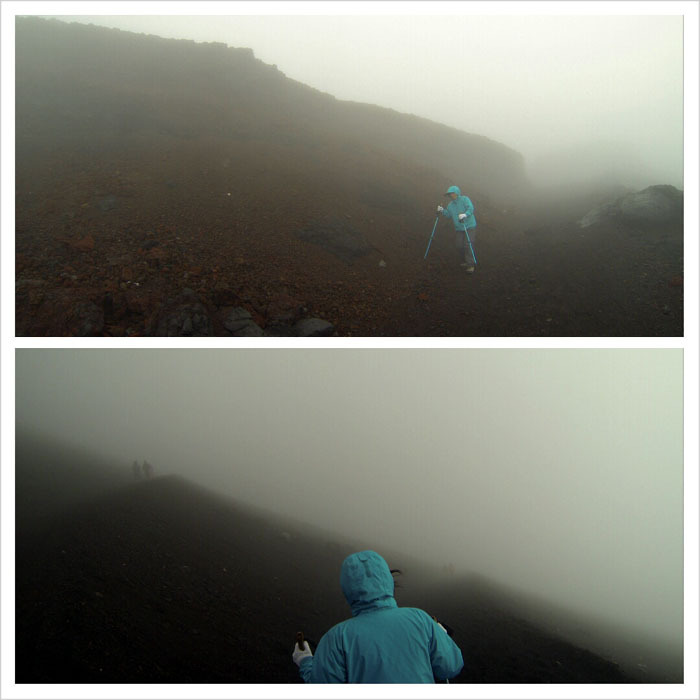 Our first hike up Mount Fuji. No sunrise. Just storming at the summit. That’s why we came back and keep coming back. Hiking gluttons for punishment. Thanks for sharing those awesome photos! You both deserve a medal for the climb again and yes I do hope you get to see that sunrise on your next climb! From the start Mari-San? Thanks! Haha we get buttons but no medals for our climb. Just had to donate 1000 yen. I don’t think Mari wants to start from the start. I want to! We’ll see. This is such a spectacular, clear and helpful description of your experience. Congrats on both Mt. Fuji summit and such clear explanation! My wife and I are planning the hike for this August (unfortunately, we can only do it on a Friday!) 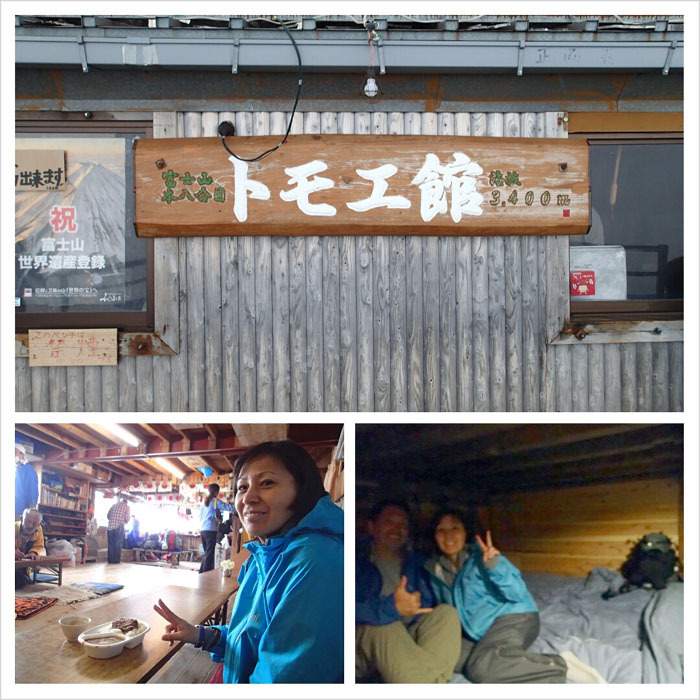 and we were wondering whether to sleep on the 7th or at the last hut past the 8th station (one named Goraikoukan). That would be mostly to minimize the night hike. 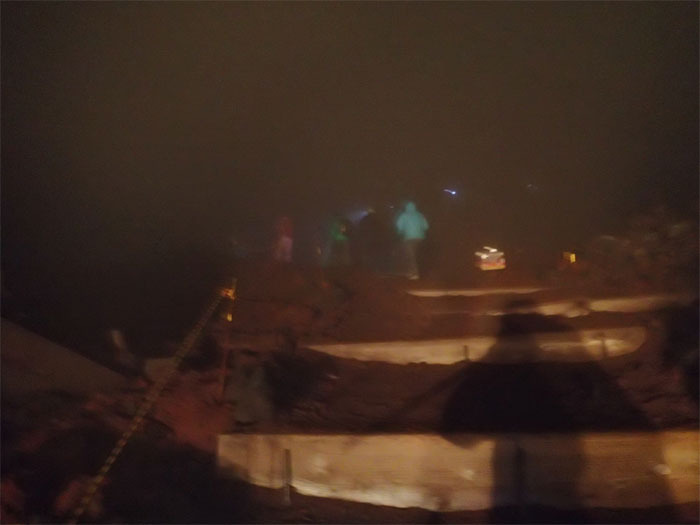 The other option seems to be to go for a lodge that comes right before the 8th station (like Hokuunso, that appears in one of your pictures). From your description, it seems something in between might be the best option…. Thanks! I would suggest staying at the last hut which as you mentioned, will minimize the night hike. Because they start rousting people out of their futons around 0100 to get ready for the biting cold hike at 0200 in order to make sunrise which pops up around 0430. Hope you get some spectacular views and sunrise! Copyright © 2010-2019 kenjiSAITO. All Rights Reserved.